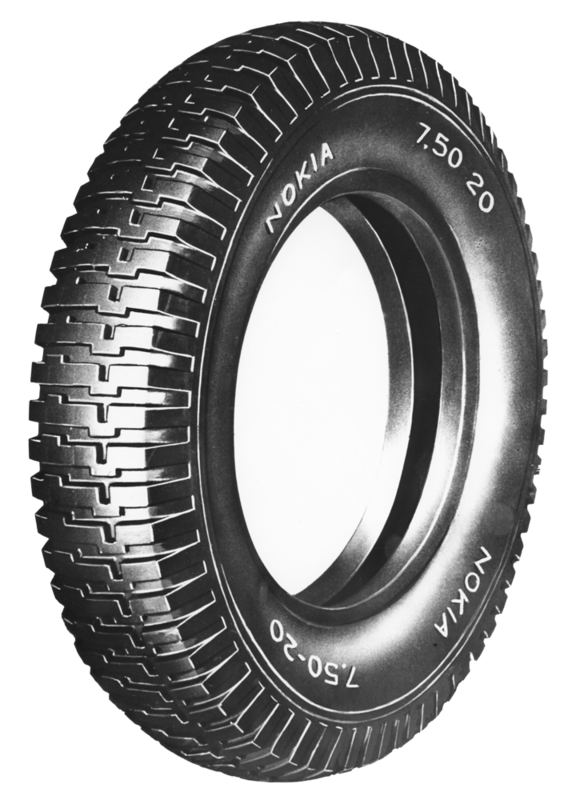 The Nokia rubber factory launched passenger car tyre production in 1932 when the compressors and curing presses required for tyre manufacture were ordered. The first Nokian tyres featured four layers of fabric and a very flat surface, as if a board had been slammed on the tyre. In the very early stages of tyre manufacture, Nokian engineers were quick to understand the need for a tyre type that was specifically suited to the Nordic conditions. As a result, the first tread-patterned tyre designed for winter use in trucks and lorries, or “weather tyre” as it was called, was manufactured. The first winter tyre paved the way for the first Hakkapeliitta winter tyre designed for passenger cars, later named Snow Hakkapeliitta. The tyre tread showed a stepped, relatively sparse transverse pattern equipped with so-called suction pads. This tread pattern remained unchanged until the 1950s. Before the Winter War, Nokian manufactured 20,000 Hakkapeliitta tyres in six different sizes. The history of Nokian Hakkapeliitta winter tyres is colourful and prestigious. Manufactured since 1936, Hakkapeliitta tyres achieved worldwide fame in the legendary Monte Carlo rallies in the 1950s and 1960s. Cars equipped with studded Kometa Hakkapeliitta tyres were superior on snowy and icy mountain roads. Finnish drivers continued to do well in rallies, giving rise to the notion of "Flying Finns". Hakkapeliitta tyres proved their unique features and were soon coveted by competitors from many different countries. The R&D principle has remained more or less the same for 80 years: the demanding objective is to develop tyres for people driving in Nordic conditions who value safety and who expect reliable tyre performance in any situation. The latest additions to the Nokian Hakkapeliitta family are the studded Nokian Hakkapeliitta 8 and the non-studded Nokian Hakkapeliitta R2 and Nokian Hakkapeliitta R2 SUV. All tyres have achieved several wins in tests conducted by both Finnish and international magazines. The tyres include many innovations that improve the grip in demanding weather conditions, reduce the rolling resistance and consequently fuel consumption and carbon dioxide emissions.